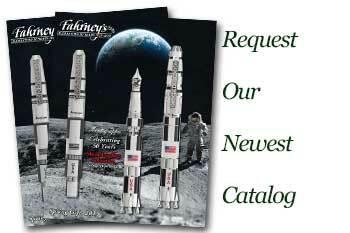 Order your Esterbrook Limited Edition FDR Fountain Pen - M nib today from FahrneysPens.com. Fine Pens, Refills & Luxurious Gifts – great prices & fast shipping. 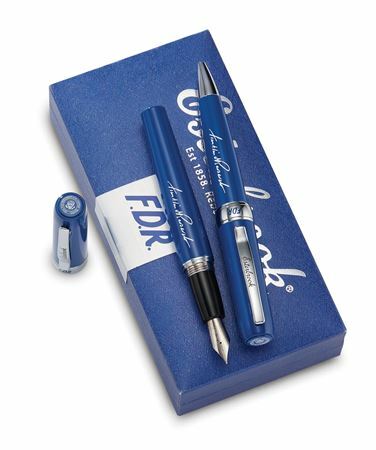 Fahrney’s is pleased and proud to exclusively introduce the new Franklin D. Roosevelt Limited Edition collection from the Esterbrook Pen Company. 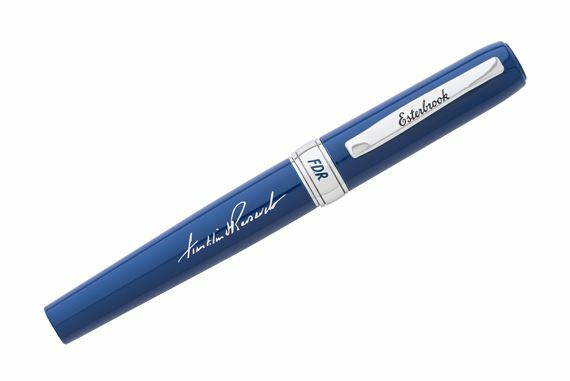 FDR is the third installment in its Presidential Series that pays homage to some of the greatest U.S. Presidents, many of whom who also wrote with an Esterbrook pen while in office. Franklin Delano Roosevelt served as Commander-in-Chief from March 1933 to April 1945, the longest presidential tenure in American history. During his 12 years in office, Roosevelt accomplished perhaps more than any resident of the White House before or since. Leading the country out of the Great Depression and responding to the rise of Japan and Germany during WW II made President Roosevelt a defining figure in American history. 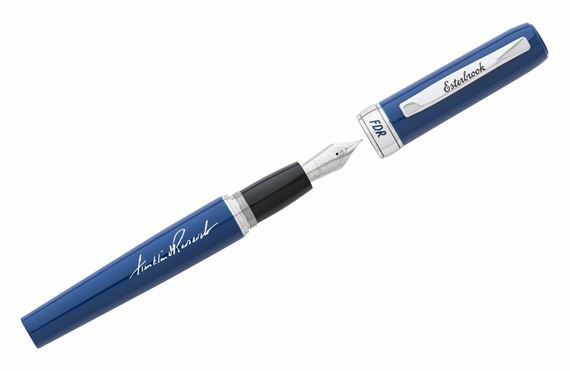 The FDR limited edition pens are solid brass layered in rich navy blue lacquer and engraved with Roosevelt’s famous signa-ture. A silver-plated central band features the same F.D.R logo used on original campaign buttons from the period. The cap top holds a coin embossed with the Presidential Seal from 1933, the year FDR took office. The fountain pen with steel nib and twist action ball pen are numbered and limited to 200 pieces. Presented in a custom blue FDR pen box.